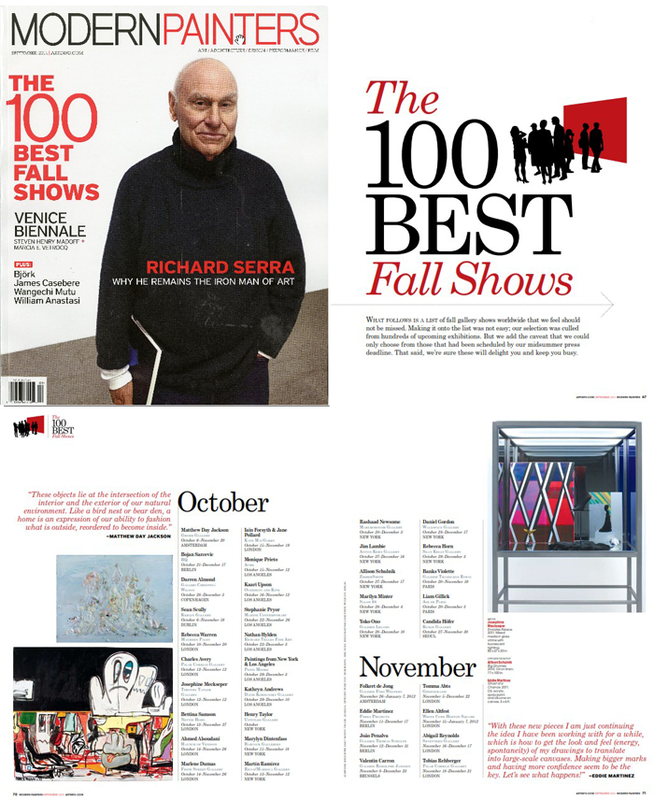 For its September 2011 issue, Modern Painters magazine selected a comprehensive list for this year’s fall art season. Ranging through galleries all over the world from Berlin to Seoul to Beijing and including artists like Sterling Ruby, Christian Marclay, Marylyn Dintenfass, and Cory Arcangel, this is the one guide you’ll need to survive the upcoming tumult of art shows. What follows is a list of fall gallery shows worldwide that we feel should not be missed. Making it onto the list was not easy; our selection was culled from hundreds of upcoming exhibitions. but we add the caveat that we could only choose from those that had been scheduled by our midsummer press deadline. that said, we’re sure these will delight you and keep you busy. “Together the two shows offer two totally different experiences of the ‘Soundsuits.’ One is like walking into a frozen frame of ‘Soundsuits’ interacting on a playground without rules that’s been elevated to the most extraordinary degree of indulgence.